1789 Deed, easy peasy. Right? I transcribed a deed between George Myrise and John Arlsberger in my last post. This deed referred to the same two lots of land that George rented from Mathias and Mary Baker in 1785. The language in the 1789 degree is much more user friendly than the 1785, but let’s put it into normal language just to be sure I’m understanding it and sharing it correctly. On January 5, 1789 George Myrise and John Arlsberger made a deal for the two lots George was paying yearly groundrents on to Mathias and Mary Baker, at the rate of 7 Shillings 6 Pence paid every May 1st. The lots being numbers 75 and 76 in the general plan of Petersburg, bordered on the North by King Street, East by a lot owned by a Nicholas Onstats (lot number 77 per the 1785 indenture), South by a 20 foot alley (previously noted as the lands of a Joseph Plautt), and on the West by a 16 foot alley. The lots are both 66 feet wide along King Street and 264 feet in depth. George Myrise acknowledges a payment for the said lots by John Arlsberger in the sum of £17 (pounds). John Arlsberger to take on the yearly groundrents payment to Mathias Baker. The deed conveys ownership as well to “the Houses, Out Houses & buildings thereon made & erected, fences, Gardens, Trees, Waters, Ways, Heriditaments and appurtenances.” The deed and payment were witnessed by a Philip Sholl and a Jacob Parr. It was presented to the Courts and signed by R McIlhinny, a Justice of the Court of Common Pleas. The deed was copied into the deed books by J Barnitz, Recorder, on 9 Nov 1789. So, we now know that George possessed these 2 lots from 22 Oct 1785 until 5 Jan 1789, a little over 3 years. As of right now, without court minutes, we can only assume that George had paid his yearly groundrents to Mathias and Mary, but our George made quite the tidy profit it would seem on these two lots. There are 12 Pence per Shilling and 20 Shillings per Pound, and at a yearly rate of 7 Shillings 6 Pence over that equals to having paid the Bakers at least £1 7s 6p. I would also assume, though, that George had built something more on those lots, as no buildings are specifically mentioned in the 1785 indenture, perhaps that is why the going price was so much more? I don’t think George lived there, though, as the 1789 deed names him a “Farmer of Germany Township” not of Petersburg where these lots are located. Thoughts? Am I getting these things right? I hope so, but please let me know if I am missing anything or just plain getting it wrong! I’d appreciate it. A 1789 Deed, shorter than the last. This is the second deed I found via the Deed Index on the York County [PA] Archives website, I transcribed the first here, and discussed it here. Now to make an attempt at the second deed. This deed concerns the same lots George Myrise rented from Mathias and Mary Baker, and is dated 1789, so now I know that George had possession of these two lots for a little over 3 years. 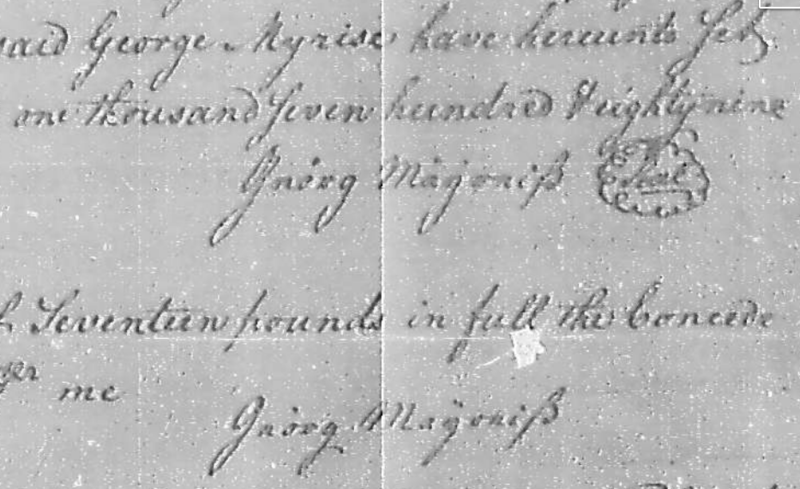 Is this the signature of George Myrise in 1789? Note the difference in writing between the Recorder’s “George Myrice” and the Signature. The script has been likened to Suetterlin Script. My thanks to Cathy Meder-Dempsey for pointing that out!